A team of scientists has reported direct visualization of magnetic charge crystallization in an artificial spin ice material, a first in the study of a relatively new class of frustrated artificial magnetic materials-by-design known as "Artificial Spin Ice." These charges are analogs to electrical charges with possible applications in magnetic memories and devices. The research team's findings appear in the August 29 issue of the journal Nature. The unique properties of spin ice materials have fascinated scientists since they were first discovered in the late 1990s in naturally occurring rare earth titanites. 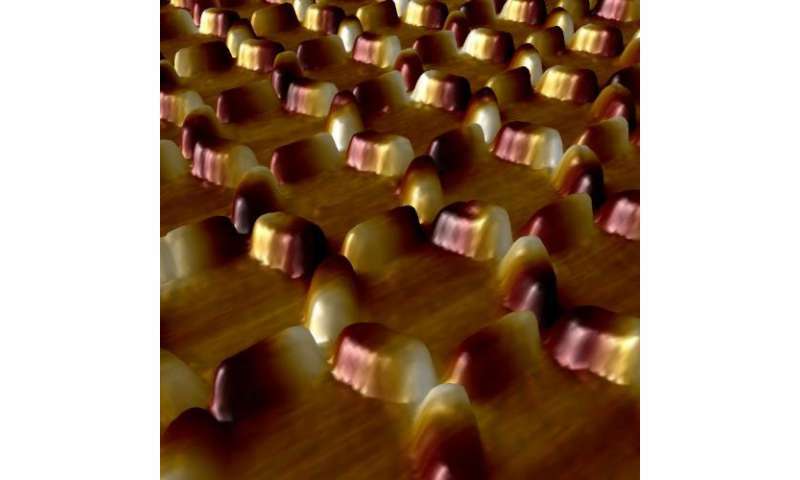 The material is aptly named: the highly complex ordering of nanoscale magnets in spin ice obey the same rules that determine the positional ordering of hydrogen and oxygen atoms in frozen water ice. Both have "spin"—degrees of freedom—with frustrated interactions that prevent complete freezing, even at absolute zero. Now the same research team has developed a new annealing protocol that allows the artificial material's full potential for highly complex magnetic interactions to be realized. The new protocol was applied to two artificial spin ice materials, one configured in a square-lattice pattern, the other in a hexagonal-honeycomb pattern with three-pronged vertices. In the honeycomb pattern, where three magnetic poles intersect, a net charge of north or south is forced at each vertex. The magnetic "monopole charge" at each vertex influences the magnetic "charge" of the surrounding vertices. 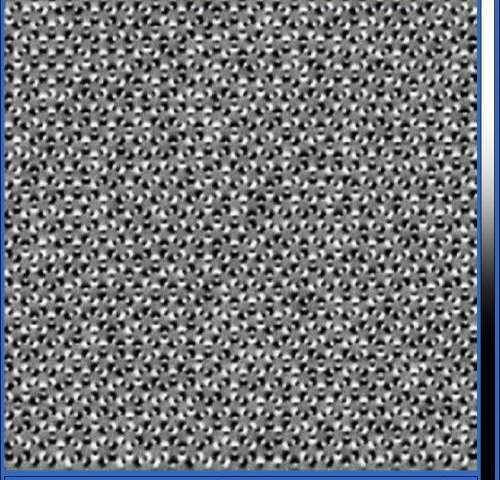 The team was able to image the crystalline structure of the magnetic charges using magnetic force microscopy. "Nanomagnets are so small that their behavior becomes relatively simple. 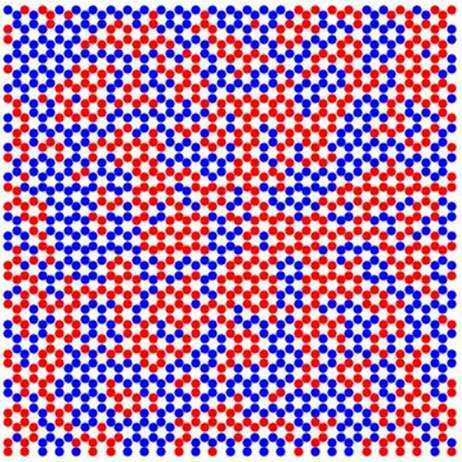 We can arrange the magnets in a particular lattice pattern—square or honeycomb—and they interact in a way that we can predict and control," explained Peter Schiffer, a physicist at the University of Illinois at Urbana-Champaign who led the team. "The challenge—you have to get the nanomagnets to flip their north and south poles to show how they interact," Schiffer added. "It's hard to force them to show the effects of interaction, since they get stuck in one particular arrangement." 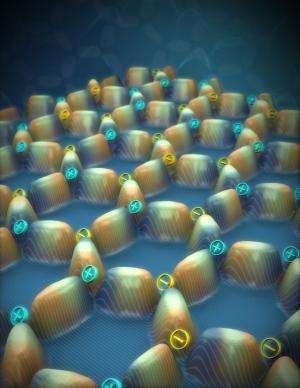 The research team's new annealing protocol—heating the material to a high temperature where their magnetic polarity is suppressed (here, about 550 degrees Celsius)—allows the nanomagnets to flip their polarity and freely interact. As the material cools, the nanomagnets are ordered according to the interactions of their poles at the vertices. Los Alamos National Laboratory staff scientist Cristiano Nisoli explained, "The emergence of magnetic monopoles in spin ice systems is a particular case of what physicists call fractionalization, or deconfinement of quasi-particles that together are seen as comprising the fundamental unit of the system, in this case the north and south poles of a nanomagnet. We have seen how arranging magnets in a honeycomb configuration allows for these charges to be sort of 'stripped' from the magnetic islands to which they belong and become relevant degrees of freedom." "Magnetic technology generally concerns itself with manipulation of localized dipolar degrees of freedom," Nisoli said. "The ability of building materials containing delocalized monopolar charges is very exciting with possible technological implications in data storage and computation." "This work demonstrates a direction in condensed matter physics that is quite opposite to what has been done in the last sixty years or so," said Nisoli. "Instead of imagining an emergent theoretical description to model the behavior of a nature-given material and validating it indirectly, we engineer materials of desired emergent properties that can be visualized directly." The theoretical work for this research was performed at Los Alamos National Laboratory under Cristiano Nisoli and at Penn State University under Vincent Crespi and Paul Lammert. The synthesis of the magnetic materials and the high temperature treatment was performed at the University of Minnesota's Department of Chemical Engineering and Materials Science under Chris Leighton. The magnetic measurements and lithography were performed at Penn State University and the University of Illinois' Frederick Seitz Materials Research Laboratory by graduate students Sheng Zhang and Ian Gilbert under the direction of Peter Schiffer.